I have been a member here a while now and have never posted anything up relating to my SW20. I suppose it is time now that I am getting more serious in working on this car. So a bit of background info to catch everyone up to where i am now. I bought my 94 GT back in 2011 here in Sydney. Can honestly say I have never had so much fun driving as I have had in this car to date. It had been a great car with only minor issues, nothing mechanical mostly interior stuff. Until October last year where one of the coolant hoses collapsed, blocking off circulation which ended in a blown head gasket. It was at this point I took on the brave project of dropping the engine, getting it rebuilt and putting back in, replacing the cooling system altogether whilst I was at it. So I bought my self a vehicle hoist and got to work! Fast forward to January this year, I had the rebuilt engine back in the car and working flawlessly. However the car went off the road again 2 months later due to ignition and poor fuel issues. Nonetheless she is back working fine until last Thursday where i suspect i am having poor fuel issues again....not to worry. It's now May and I am ready for another project. So I have just taken delivery of a Gen 3 half cut. The half cut has come with some nice goodies as well; such as an aftermarket intercooler and piping, chipped ECU and intake. I plan to have the conversion all done by the end of next month....but we will see what happens. 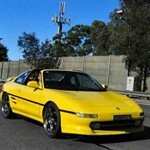 1990 SW20 MR2 N/A with 1994 Gen 3 GTS 3S-GTE swap. Thanks, im sure there will a few things that i will be unsure about. The first being how to retain cruise control as it doesnt seem like it will fit between the strut tower and the IC. Looks awesome!!! Is the halfcut pink or red? I'm liking that wing lol! Cheers man. Its red but its terribly faded. Yeah i havnt decided whether i like the wing or not yet haha. Looks similar to the one on the new 86. I had the same trouble with my cruise control when I did my conversion. I always had a plan to get it back up and running (maybe source the turbo cruise control gear) but it has fell on the back burner. Bummer was hoping there was a slight chance that it would fit. Suppose i dont use it that often anyway. Good luck with the conversion. Looks like it has an aftermarket exhaust fitted as well? What ecu is in it? Thanks. It has a large single but its unusable as it is rusted and has holes through it. I'm really looking forward to see what the results are going to be like. I am unsure of what company has chipped the stock ECU. Bit wary to take it apart to find out as I dont have an anti-static mat. wow that a good score, good luck with this man, should be a totally different car when finished. since you already have the gen 3 spolier the TRD will fit in the same holes afaik, so not hard to tak it off if you dont like it. or can keep swapping it around. Nice one Declan! Look forward to seeing it all complete. As for the cruise, I had a similar issue when I did my engine swap. It will fit and work normally with the standard intercooler, but with most aftermarket ones it won't as you've found out. I ended up pulling all the cruise control parts out of the engine bay as I barely used it anyway. Cheers. I think ill do that; get it sprayed and swap it around when i want to. Not to worry, ill just remove it. Like you, i really dont use it much either. How did you go re-routing the throttle cable to suit? I can only pray it hasn't been tuned for higher octane fuel and has only been done to eliminate boost cut.